This is Sudan. Currently he is the last, surviving great northern rhino in the world. As far back as 1919, there were two to three thousand great northern rhinos in the wild. By 1989, there were only 15 left in the wild and by 2007, 0. Why, you ask? Extensive poaching of course. When conservationists realized what was happening, they began to pull the wild rhinos and bring them to captivity in the hopes of starting a breeding program to repopulate the dying population. Captivity didn’t work so well for these big beasties. For one reason or another, their survivability rate continue to plummet in captivity. It was decided that the last few great northern rhinos would be transferred back to the wild, where, naturally, they thrive better and have round the clock, 365 day, armed protection from puny poachers. 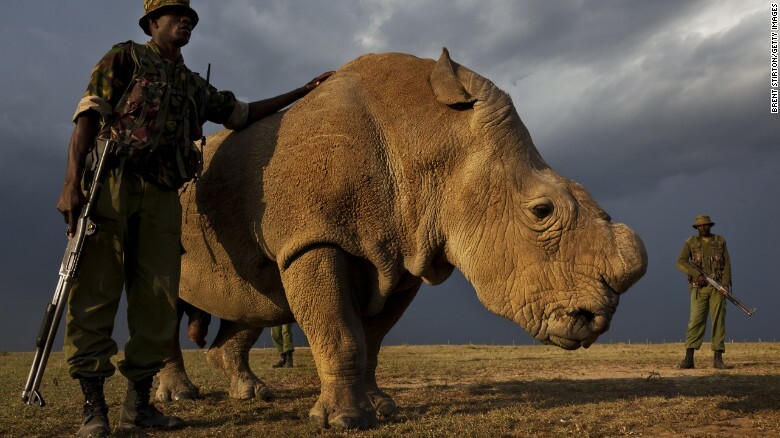 Sudan and his species plight has garnered more attention as of late because the Ol Pejeta Conservancy has started a Tinder profile for this handsome specimen of rhino in order to raise donation money to be able to perform in vitro fertilization. So far its been a real hit, but they have a long way to go. Million dollar question Mr. Mel.